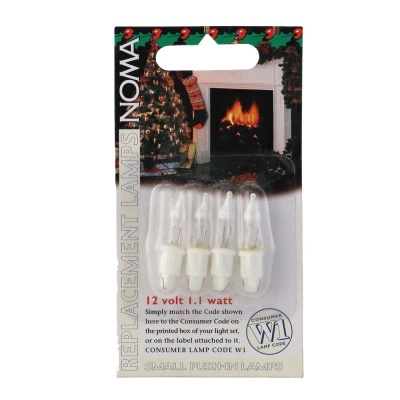 Noma® W1 12v 1.1w Fuse Lamps Pack (0340F) small push in fairy light fuse lamps for use with Noma Christmas light sets that require a W1 spare lamp code, e.g. Pickwicks, Canterbury Bells, Winter Crystals, Victorian Lanterns and more. Approximate lamp measurements: 35mm overall length, 5.5mm glass diameter, 8mm diameter of base at widest point, 14mm length of base excluding plastic lip. Fuse lamps only in this set. Simply match the consumer lamp code W1 with that on the cable label wrapped near the plug, to ensure these correctly correspond with your light set.